The widespread festivities celebrated in Malaysia calls for a good time and gives us just the reason to get together. With Hari Raya around the corner, Sunway Lagoon is taking it to the next level in its trendy Hipster Raya celebration! You have probably heard how much a hipster weighs (Answer: An Instagram), a joke made popular with the platform being widely used among hipsters, and now you can dress up as one, experience a fun day out with family and friends at Sunway Lagoon, take Polaroid pictures and post them on Instagram! Immerse yourself in the trend with an amazing lineup of activities with the Cray Cray DJ Spinning playing the latest hits and immortalise that picture perfect moment with your squad joined by a group of hipsters at the Hipster Raya Posse photo booth. Learn to groove or show off your swag moves with the Mali Cove Swag Dance performers or join the Hipster Raya Pool Party. Play some classic Beach Activities a la Malaysian style in a sepak takraw game, build sand sculptures and more! If you are thinking of getting a swanking new ride, look out for the Spend & Win Raya Contest where one (1) lucky winner will walk away with the classic and stylish Vespa worth RM 15,000! To be entitled, simply spend a minimum of RM100 (up to 3 combined receipts at Sunway Lagoon’s retail, tube rental, lockers or F&B stores) to get an entry form. Submit the completed entry form along with the receipt(s) at any participating retail outlets, namely Nickelodeon store (Main Entrance), Sahara (Zulu Walk) and Surf Haven (Surf Beach Entrance). Participate in the Raya with a HIP Style social media contest from 15th to 21st June 2017, to be in the running to win exclusive prizes from a Sony Xperia Dual Z5, Sunway Lagoon admission tickets and ice skating tickets! Participants will have to like Sunway Lagoon Malaysia’s Facebook page, complete all 3 rounds of the contest posted daily at 12:00pm, and submit their details within 19th to 21st June 2017. Visit Sunway Lagoon today and flaunt your Best Day Ever pictures during Raya to your friends! 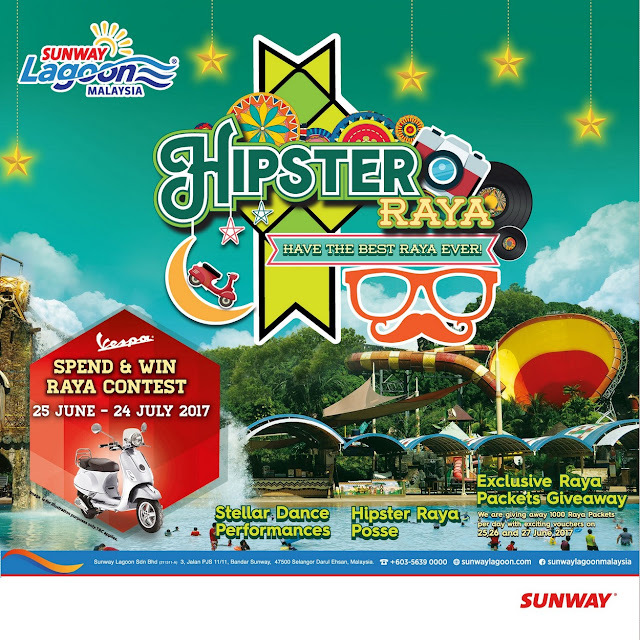 Remember to hashtag #SLHipsterRaya and #SunwayLagoonMY.